Want to learn something new this falll? I have a series of group classes on the schedule at the Weavers Guild of Greater Cincinnati. All Registration for the classes is through Eventbrite. Non-members of the guild pay an additional $25 for the class, but that can be applied towards a membership at the guild if you fill out an application in class. Guild membership is $50/year (July 1-June 30). If you are under age 30, its only $25 a year. The first one is Beginning Weaving on a Rigid Heddle Loom, In this class you learn to weave a scarf in a day! NO experience necesary. Loom kits are available to rent for class. Monday September 10, 2018 at 9am, Register on Eventbrite. The second one is Waffle and Pick Up on a Rigid Heddle Loom. 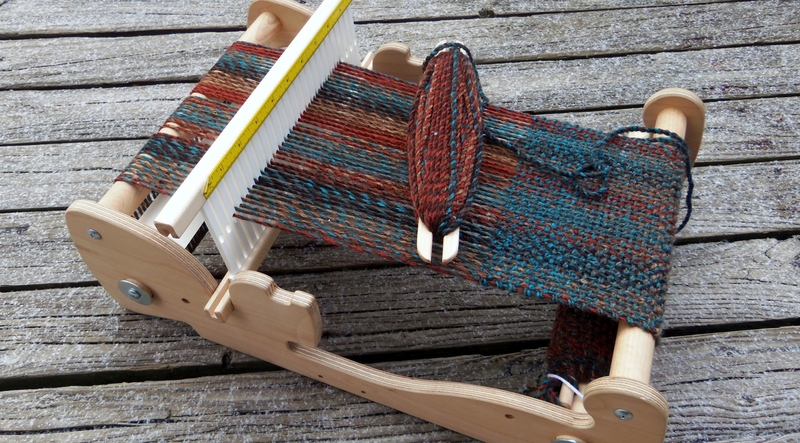 This class requires you to have previous successful warping of your loom and your own Rigid Heddle loom, since you must warp it on your own prior to the class. If you are a guild member, a loom rental can be arranged from the guild.) 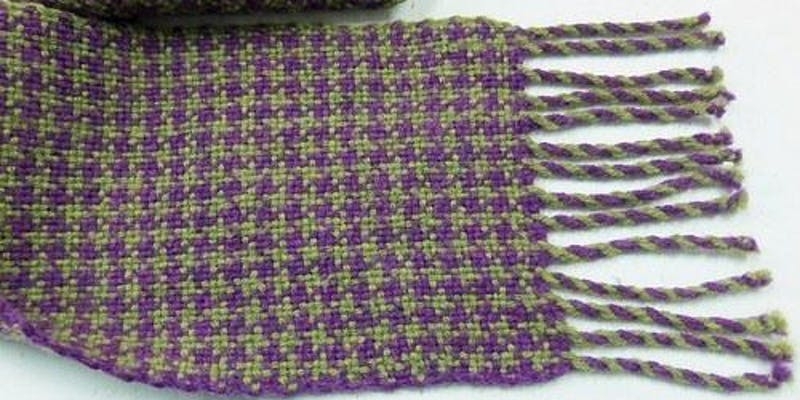 you will learn how to use a pick up stick to create textures and patterns in your weaving. Third is a Houndstooth Check Scarf on a Rigid Heddle Loom. 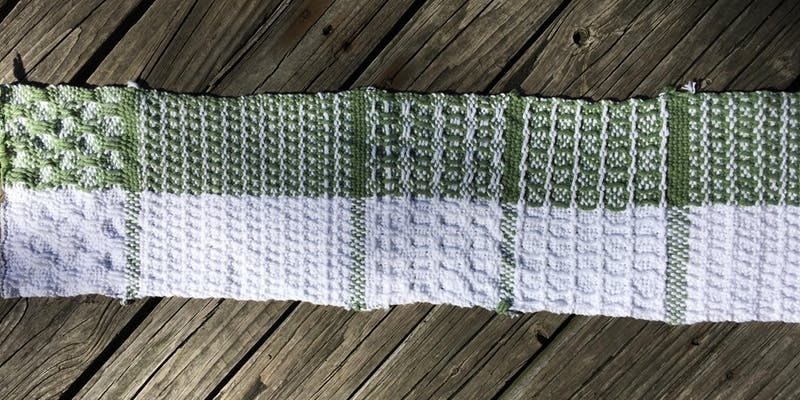 This class is a 2 color weave that will teach or reinforce your direct warping skills and teach you two handle 2 yarns while creating a balanced plain weave, hemstitch and twist fringe. Meets over 2 days. Suitable for a beginner. Love these socks, I am tempted to keep them for myself. (That’s the danger when I make a pair in my own size). If they don’t sell soon, look for them on my feet! 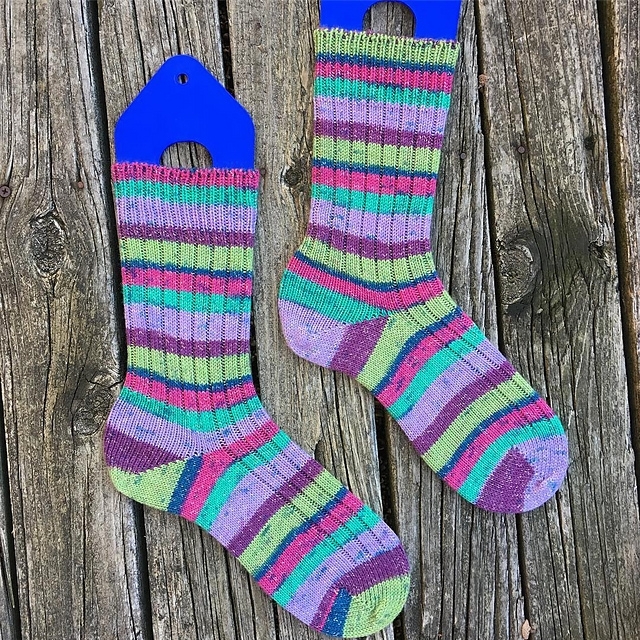 I cannot get any more of this yarn, so when they are sold, they are gone… UPdate SOLD! I bought a new dress to wear for a wedding tonight, it just needed the right accessory to make it look great. So this morning I pulled out one of my silk scarf blanks and mixed up a little Jet Black Jaquard Acid Dye in a jar with boiling water. I made a shibori “donut” by folding the scarf in half and rolling it around a piece of cotton twine on the diagonal. You then pull the twine tightly and tie it to make a little silk donut. Then I wet it and dunked it into the jar of dye. After microwaving it on and off to keep it hot and stirring it with a chopstick, I added the vinegar to set the dye. I microwaved it a little more, then rinsed well with synthopol and ironed it dry. In less than an hour, I had the perfect accessory! Check out my Instagram feed, measuredthreads, for a few more photos. I’m getting ready to wind my warp for a workshop I am taking at the Weavers Guild of Greater Cincinnati. Nationally renown weaver Rosalie Neilson (of rep weave fame) is conducting a workshop on block design and color with huck lace at the Guild house and it starts next week. First I had to get my vintage but new-to-me 4 shaft, 4 treadle, 22″ Harrisville Designs loom ready for the workshop. I wanted to use it rather than my Dorothy loom table loom since it has treadles. The HD loom was a freebie from a neighbor of a friend who was cleaning out her basement. I was so excited to get it because I really like my bigger HD loom. The “new” loom needed shaft cables and tie up cords replaced along with a good cleaning. I also rearranged the direct tie up from 1, 2, 3, 4 on the treadles to 1, 3, 4, 2 so that I can “walk” the treadles while weaving. I finished up the restoration yesterday and started to prepare my warp today. I had to choose 4 colors, one is for a border to separate the blocks and the other three are the colors for the blocks. 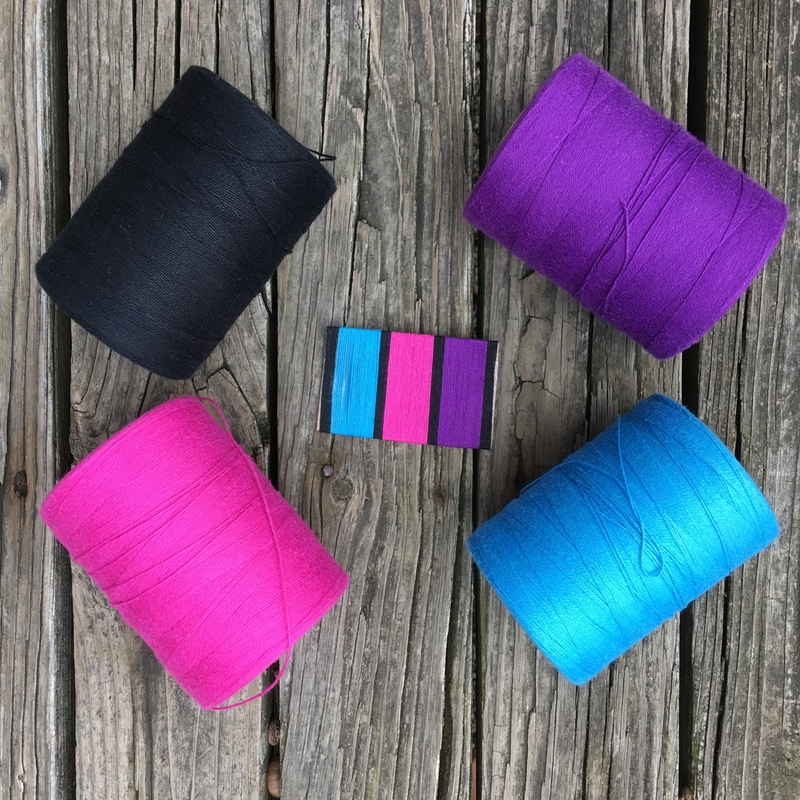 We were instructed to make a wrap of our warp colors to see how they all went together. 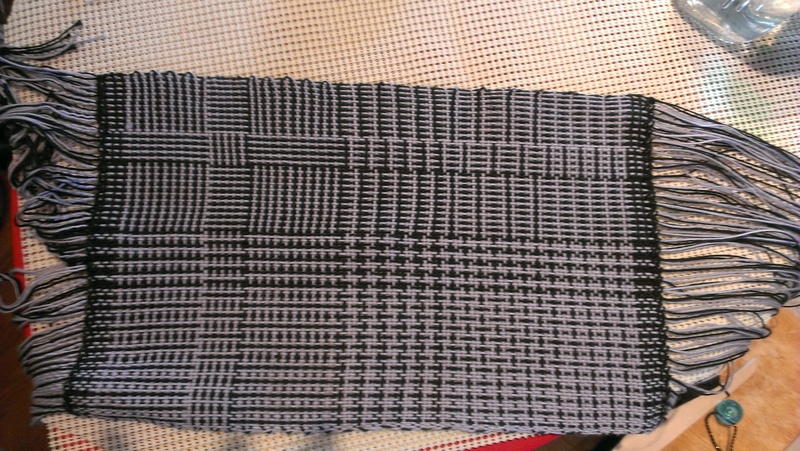 Making a wrap is a common part of design in weaving. I dithered a lot and finally settled on the colors I had originally been drawn to and wrapped them up. They are a bit bold aren’t they? Now to wind the warp! 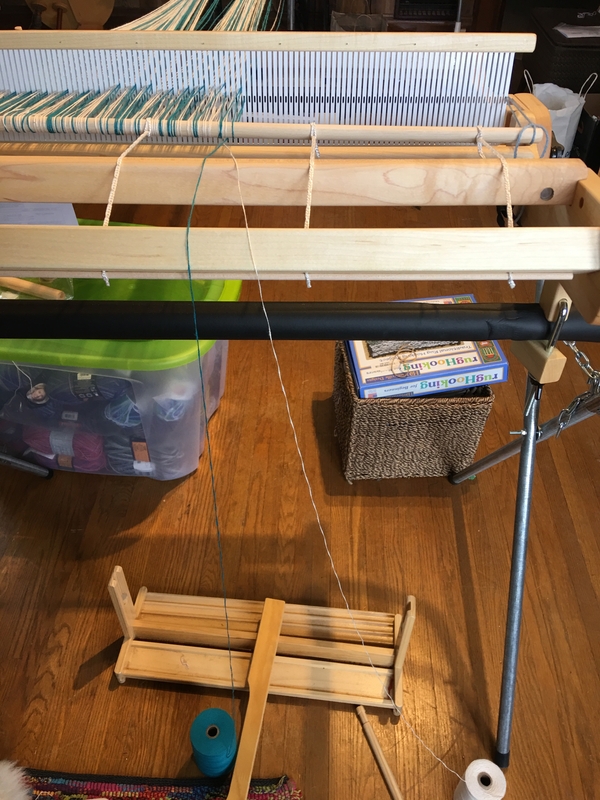 I got a new 20 inch Schacht Flip Rigid Heddle Loom! 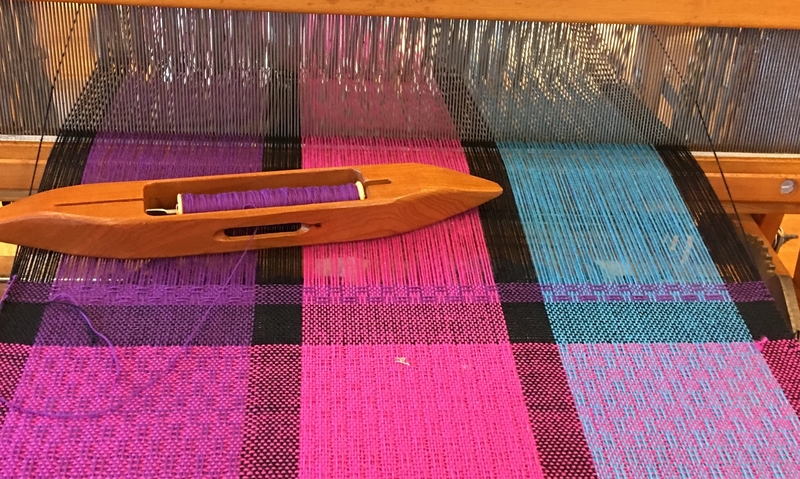 I have been wanting to design some color and weave tea towels for the rigid heddle loom. The 16 inch looms I own (an Ashford RH and a LeClerc Bergere) wouldn’t cut it for the size towel I wanted. As much as I love my little 10 inch Cricket looms (another well made Schacht product), I think the Flip is the best rh loom on the market when you want something a little bigger. Yesterday I put the loom together in about five minutes, and then finished designing and calculating the yarn needs for my project.I’m using two colors of 8/2 cotton in the warp and weft I decided to direct warp the project. I put enough warp length on for two towels plus a little extra for sampling. Keeping the spools of yarn separated at the back of the loom on the floor keeps them from twisting around each other as I warp. Using 8/2 cotton will keep the towels from being too bulky and the great thing about the 8/2 Cotton is that two threads and each slot in hole of a 10 dent heddle works perfect at 20 e.p.i. for plain weave. I just direct warp, filling both the slots and the holes with one loop of thread following my color sequence for the pattern. (Using the IWeaveit app’s threading tracker made that a breeze). To make direct warping easier for such a wide project, I did two things. I put my loom on a stand that was high enough so that I didn’t need to bend over as I was threading the heddle. Ergonomics in weaving are very important. 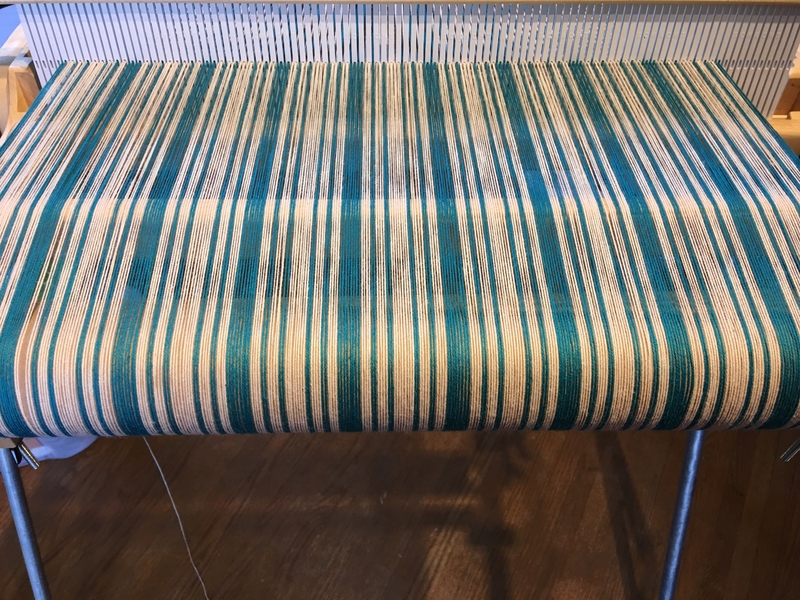 And rather than direct warping to one central peg, I used a small warping board clamped flat to a small table and used three pegs with a third of the warp to each peg. (See the first picture above). That will keep each warp end closer to the same length. If I had using only one centrally placed peg, the warp ends would be longer at the outside edges of the warp than in the center of the warp since they would have a longer distance to travel. The warp only took about an hour and a half to measure and thread 360 ends (180 slots and holes). Since the holes are already threaded, when I wind on and tie onto the apron rod, I am ready to weave. I did make one miscalculation while warping. I assumed my heddle was 20 inches wide since I bought a 20 inch wide weaving width loom. 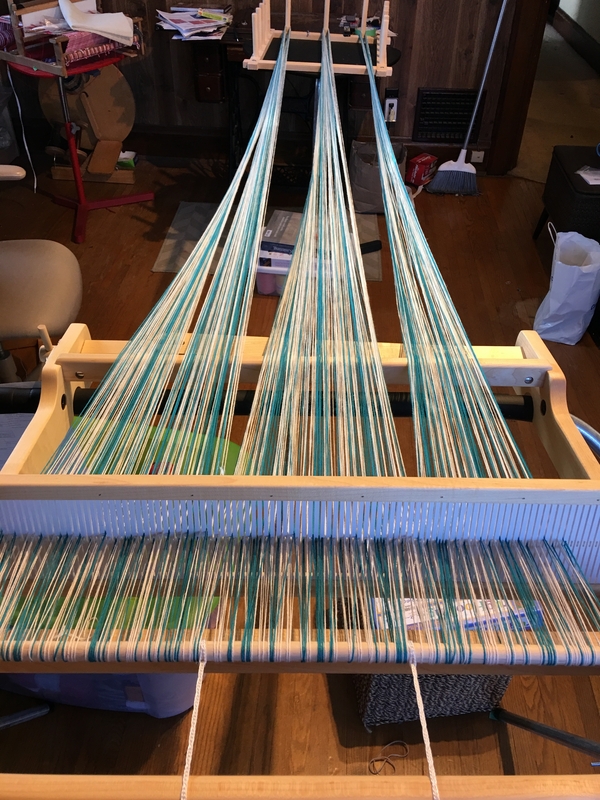 Since my warp was going to be 18 inches wide, I started threading one inch in from the edge of the heddle to center my warp (there should have been only one inch left un-threaded on the other side). As you can see, it’s not centered. The heddle is actually 20 and 5/8 inches. If I had checked before warping, I could’ve added another repeat of the color sequence and still not be weaving the full width of my loom. I think weaving from edge to edge the full width invites problems, so I like to leave at least two slots empty on either side of the warp. I will have to remember that tidbit for the next wide project I make. Now off to wind shuttles!